Although registered nurses (RNs) and licensed vocational nurses (LVNs) both practice in the health care industry, there are a number of distinctions that set one apart from the other. While these medical professionals may have some similarities, their differences in terms of education and training, skills, responsibilities, and expected salaries draw clear lines between the two. 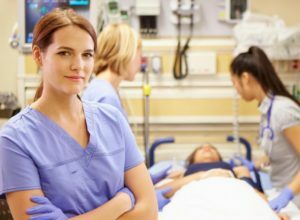 To start with, being a Registered Nurse requires having a diploma after successfully completing a nursing program, receiving an Associate’s degree, or a Bachelor’s of Science degree in nursing. A nursing program diploma under an Associate’s degree program usually only takes two years, while a Bachelor’s degree program requires a four-year commitment. After formal education, a nursing graduate must pass the National Council Licensure Examination and other statutory requirements as mandated by State law to become an RN. On the other hand, being a Licensed Vocational Nurse requires only the completion of a certificate program at a community college or career center. This education takes only a year, covering the subjects of nursing, pharmacology, and biology. Both RN and LVN programs include supervised clinical experience in hospital departments such as pediatrics, psychiatry, maternity, and surgery. Bachelor degree programs usually include more training in the physical and social sciences, communication, leadership, and critical thinking, which is becoming more important as nursing practice becomes more complex. LVNs possess the necessary skills to provide care and assistance to patients in a wide variety of clinical settings. They may be employed in different environments such as medical clinics, schools, and even as home care providers. They offer assistance ranging from the administration of oral medicine, dressing wounds, to personal hygienic routines. Depending on their relevant other skills, training, and experience; LVNs may pursue voluntary certification in additional skills such as in gerontology, foot care, or IV therapy. While LVNs possess general knowledge and skills to provide care and assistance to patients, RNs have more specialized skills and knowledge in the same areas of practice. RNs may perform diagnostic tests and analysis, and educate patients and their families on managing illnesses as well as operating medical equipment. Responsibilities of an LVN may be considered more intricate, though less demanding and delicate than those of the RNs. LVNs are expected to provide bedside care, including bathing and dressing, and assistance with other daily tasks as required. RNs, on the other hand, may assist in the administration of anesthetics, IV medications, and other more specialized health care needs.